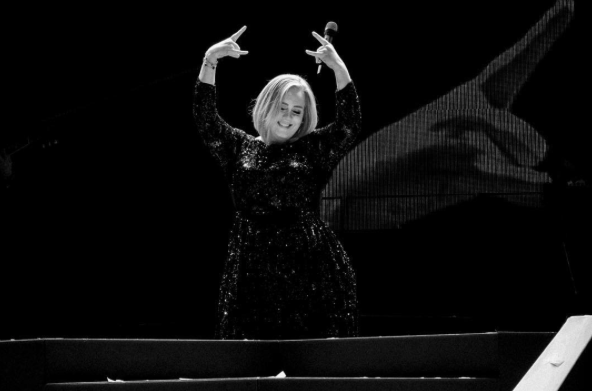 Adele announces she's "off to have a baby"
“I’m not pregnant. I won’t get pregnant until the end of the tour,” she clarified to fans at the Talking Stick Resort Arena gig in Phoenix, E-online reports. The singer had previously said she was happy being the mum of one and step-mum to her husband Simon Konecki’s daughter, but as almost 4-year-old Angelo approaches school age, she admits she’s having second thoughts. “My son is about to turn 4 very, very soon. I’m starting to get very emotional about it because I feel like once they turn 4, they’re not really your actual baby anymore. So, my womb is starting to ache a little bit. It’s like, ‘Baby, baby, baby. Need a baby, need a baby,'” she told her Nashville’s Bridgestone Arena audience a few weeks ago. Adele, who will tour Australia in March 2017, had initially been reluctant to entertain the idea of another baby. She’s recently talked about her experience of postnatal depression when she had Angelo and had told Vanity Fair she was worried about getting pregnant again. It seems that the womb-ache has trumped her understandable worries about a PND repeat and we could see a pregnant Adele ‘Hello’-ing us on our fine shores next year.